This is a new feature where I highlight books that upcoming movies are being based on. Today, I’m highlighting A Princess of Mars, the science fiction cult classic that the new Disney movie, John Carter, is adapted from. Goodreads Summary: Let the adventures begin, as Captain John Carter finds himself transported to the alien landscape of Mars--where the low gravity increases his speed and strength exponentially. Taken prisoner by Martian warriors, he impresses them with his remarkable fighting skills, and quickly rises to a high-ranking chieftain. But the heroic Carter's powers thrust him right in the middle of a deadly war raging across the planet--and a dangerous romance with a divine princess. John Carter, a captain in the confederate army, goes prospecting in Arizona at the end of the civil war and runs afoul of the Apaches. He hides out in a cave where he is mysteriously transported to Mars and captured by green Martian men who are 15 feet tall and have six limbs. Due to the difference in gravity, Carter has superhuman strength and agility, powers that come in handy as he gets embroiled in the planet’s politics and works to save the humanoid red Martian princess, Dejah Thoris. A Princess of Mars is like a western set on Mars. Carter goes from fighting Native Americans in the Arizona desert to fighting Tharks in the Martian desert within a 24 hour period. His holds the same amount of disdain for both groups referring to them as ‘savages.’ Burroughs’ writing was a little hard to get into at first but I was fine after the first few chapters and really got into the story after that. The world building in A Princess of Mars is excellent. Burroughs does a great job of creating the landscape of Mars as well as the planet’s myriad of interesting inhabitants. The story is told from Carter’s first person perspective which is also interesting because pats himself on the back quite often. In addition to seeing Carter in action being a gallant gentleman, a brilliant war strategist and a formidable fighter, he tells us that he is. All the time. Let’s talk about the Carter’s love interest, Dejah Thoris, the princess of Helium. While she does not seem particularly helpless, Carter has to rescue her over and over again. Dejah Thoris has a strange affect on men: they either pledge their undying devotion to protecting her or they fall madly in love with her and selfishly want her for themselves. John Carter does both and combined with his first person narrative, this book gets a bit cheesy. I can’t finish this review without mentioning the racism and sexism in the book. To be fair, I’m sure this was not an issue in 1912 when the book was written nor do I think Burroughs was trying to be offensive. Nevertheless, Carter’s thoughts and attitude towards to Native Americans and green Martians is in sharp contrast with how he regards the humanoid red Martians and their ancestors, the fair skinned fair haired Martians. I doubt they will include this in the movie. A Princess of Mars is a sci-fi classic and despite the cheesiness and the isms, it’s worth reading, especially if you are a fan of the genre. It was Burroughs’ first novel, pre-dating his more famous Tarzan series and it also inspired a lot of other sci-fi authors including Ray Bradbury and Arthur C. Clarke. Now that I have read the book, I’m looking forward to the movie. 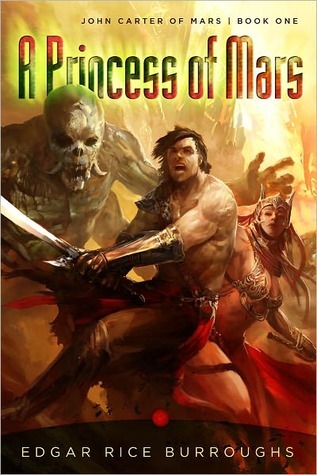 Have you read A Princess of Mars? What were your thoughts on it? Are you planning on seeing the movie? Cover Note: Since this book is 100 years old, it has had a lot of covers, most of them featuring Dejah Thoris in revealing outfits. What’s really interesting is that as far as I can tell, everyone on Mars is naked and Dejah Thoris even tells John Carter that when she sees pictures of people on Earth, she can’t understand why we wear clothes. Easy to see why this book remains popular among teenage boys. Wow - I had no idea that this movie was based on such an old book. I wonder if they'll still have him fighting Native Americans, as that's not really PC. Very interesting! I grabbed this off of Amazon this week and it looks like something I'd love. I can't wait to read it before I see the movie. But it seems like I read somewhere that the movie covers the first three books...have you read that anywhere? And are you planning on reading any more of the series? Asheley, I thought John Carter was just about the first book, A Princess of Mars, which has more than enough action for one movie. I'll post here after I see the movie. More than likely, I'll read the next book but probably closer to when the next movie in the series come out.